How do you make a good book great? You work with Bradley Beaulieu. In this four-week workshop the acclaimed fantasy author will teach you what it takes to keep your readers glued to the page. It’s hard to write a book. It’s even harder to write a good one. And at times it can feel impossible to create one that keeps readers glued to the page. 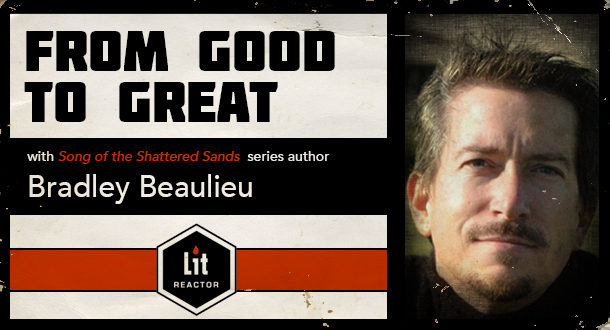 In From Good to Great with acclaimed fantasy author Bradley Beaulieu, students will learn advanced techniques that will help take their story to the next level. The topics include discussions of how your story can be strengthened with techniques such as foreshadowing and character building, how to steadily develop your plot while also preparing for plot twists, how to open your story in a powerful way and develop upon that initial success—plus many other techniques that will help you to create a more compelling and entertaining read. Each week will feature a video presentation of the material, an assignment that will be reviewed by your instructor and your peers, and reviews of your peers’ work to better cement the concepts discussed in the lectures. In writing, there are many different techniques that are rarely discussed together. Foreshadowing, parallel threads, theme, tone, character building, and more. In this seminar, these topics are discussed from the viewpoint of strengthening the story as a whole, taking a story that feels loose and directionless and working with the material that's already there to make it strong and vibrant. Writing assignment: Students will write two different types of connective tissue, each only a few hundred words in length, to begin to master the concepts discussed during the lecture. The ability to recognize patterns is a basic human trait. We use it over and over again in our fiction. This seminar discusses how to use patterns to your benefit by both setting and breaking expectations. Learn how to draw your reader in by challenging their expectations, and take character building, plot progression, plot twists and setbacks, and world building to the next level. Writing assignment: Students will write two different patterns and then break the pattern to show how doing so can increase reader involvement and enjoyment. It's easy while writing to focus on the mechanics of writing and forget that fiction is a form of entertainment. Writers can become lost in topics of theme, characterization, plotting, or even the line-by-line writing, while forgetting to accentuate the things that make people want to read books in the first place. This seminar discusses the entertainment value of writing, and the techniques you can use to maximize each scene for a more engrossing, emotional, page-turning read. Writing assignment: Students will create two writing samples chosen to illuminate the concepts discussed during the lecture. Topics to include: Story Development, Openings, Presenting backstory, Writing sparely, and Pacing. This week is a continuation of the concepts begun in Week 3. It's easy while writing to focus on the mechanics of writing and forget that fiction is a form of entertainment. Writers can become lost in topics of theme, characterization, plotting, or even the line-by-line writing, while forgetting to accentuate the things that make people want to read books in the first place. This seminar discusses the entertainment value of writing, and the techniques you can use to maximize each scene for a more engrossing, emotional, page-turning read. Writing assignment: Students will create two writing samples chosen to illuminate the concepts discussed during the lecture. Topics to include: Maximizing immersion, Your spin on the story, Structure and chaos, Middles, and Endings.